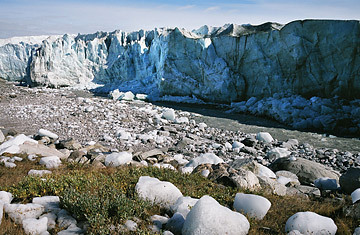 Ice boulders left behind under the Russell Glacier, after a flood caused by the overflowing of a lake, east of the town of Kangerlussuaq, Greenland. From 30,000 ft. up, flying over the heart of the ice cap, you can't imagine it would ever be possible to lose Greenland. The only flaws in the sheer, marble-colored landscape are the black shadows cast by the scattered clouds above. But as our plane heads west toward the old American air base at Kangerlussuaq, puddles of blue glacial melt begin to appear  vast, unblinking eyes that reflect the sky back up. Then the whiteness is suddenly ruptured and the ice wrinkles and thins, revealing slashes of rock beneath the 2.9 million cubic km of ice. By the time the coast comes into sight, the ice sheet ends abruptly, leaving bare brown dirt and rock. Finally, as we descend to Kangerlussuaq, the green in Greenland is visible. I'm in Greenland with a team of scientists, Danish officials (Greenland is a loosely governed Danish territory) and other journalists to visit a research project that may help answer one of the most important questions in climate science today: Will global warming melt the Greenland ice sheet? The massive ice sheet that covers all but the rocky coasts of Greenland is a relic of the last Ice Age. If it were to melt, it would release enough water to raise global sea levels by some 7 m  and that would spell the end for major coastal cities like New York City and Shanghai. No one expects that to happen anytime soon (or even anytime not soon), but the scary truth is that we don't really know how Greenland will react to rapid warming. The most recent assessment by the Intergovernmental Panel on Climate Change didn't directly take into account the possible loss of the Greenland ice sheet, noting that the data were too uncertain. We don't even know exactly how much ice is being lost from the island now. One of the best ways to try to figure out what will happen in the future is to ascertain what happened in the past. That's why we're in Greenland. Our team will be visiting the North Greenland Eemian Ice Drilling (NEEM) project, an international research team that has staked out a corner of the island's ice sheet and will, as the name suggests, drill. The ice in central Greenland is nearly 3 km thick, and as you drill down to the bottom, you can read the climatic history of the island as if you were counting tree rings going back tens of thousands of years. Oxygen isotopes trapped in the ice core can tell you what the temperature was in a given year; trapped air bubbles can reveal how much carbon dioxide and other gases were in the atmosphere at a particular time. You can even trace impurities that were in the air during the Roman Empire to a specific lead mine in Spain, according to J.P. Steffensen, one of NEEM's field leaders. Such experiments have been done in Greenland and Antarctica for decades, with ice cores that can track climatic history up to 800,000 years ago, and they've helped form the bulk of our knowledge about past climate change. But the timeline is patchy, especially in Greenland, where we haven't been able to get a reliable ice core dating from 115,000 to 130,000 years ago. That's the Eemian period, and during those years the earth was some 5�C warmer than it is today. The NEEM scientists, whose ice cores should track back to that period, want to find out how the Greenland ice sheet reacted to the warming  with the hope that it will give us clues to Greenland's fate in a future that is sure to be hotter. Our first stop on July 30, however, is Kangerlussuaq, the area's main airport and a staging ground for the NEEM project. Kangerlussuaq lies so far north that the sun never really sets in the summer, as I discover during a somewhat sleepless night. And the climate here is anything but Arctic. In the heat of the sun, temperatures exceed 70�F, and I shed layers of fleece as I take a jet-lagged walk around town. Not that there's anything to see: Kangerlussuaq didn't really exist until the Americans began using it as an air base in World War II, and though it reverted to Greenland control in 1992, it still feels like an abandoned military camp. But Kangerlussuaq, which sits just off the rocky northwest coast of Greenland, is also home to one of the largest glaciers in the world, one that is melting speedily, pouring freshwater and the occasional iceberg into Baffin Bay. After getting properly outfitted for our trip to NEEM the next day  our weather forecast is in the teens, but temperatures really can be polar even during the summer  we take a car trip out to the vanishing edge of the glacier, some 30 km outside town. It's the waning hours of the afternoon, though it's hard to tell; time loses its meaning during an Arctic summer. As we drive down Kangerlussuaq's only road, we pass sprawling glacial-melt lakes of the purest blue, framed by rocky hills dusted with brush. The landscape seems freshly carved, as indeed it is in Greenland, where the expansion and contraction of ice constantly remakes the earth. Finally, the glacier itself: a sheer cliff of white bleeding into rock. It's moving  though we can't see it  but the melting is visible in a raging river that pours down its side, as if bleeding. The Greenlanders in our group say it melts more and more each summer and recovers less and less. Actually, the speed of the glacier toward the sea has slowed in recent years  but that's not because there's more ice. Paradoxically, because so much ice has melted away in central Greenland, there is less pressure on the coastal glaciers to move. In Greenland, more than any other place, you can see global warming in action, and as I stand before the glacier, that's what I'm seeing. The landscape is changing, perhaps in frightening ways. But we don't yet know for sure where it's going. For that we'll have to go to NEEM and the geologic past.